In a few short weeks, I will recognize (and celebrate) the anniversary of the end of my treatment from bone cancer. Twenty years since I walked out of the hospital, bald, skinny, nervous of what the future held for a young adult cancer survivor, and incredibly hopeful and excited for a new chapter and chance at life. 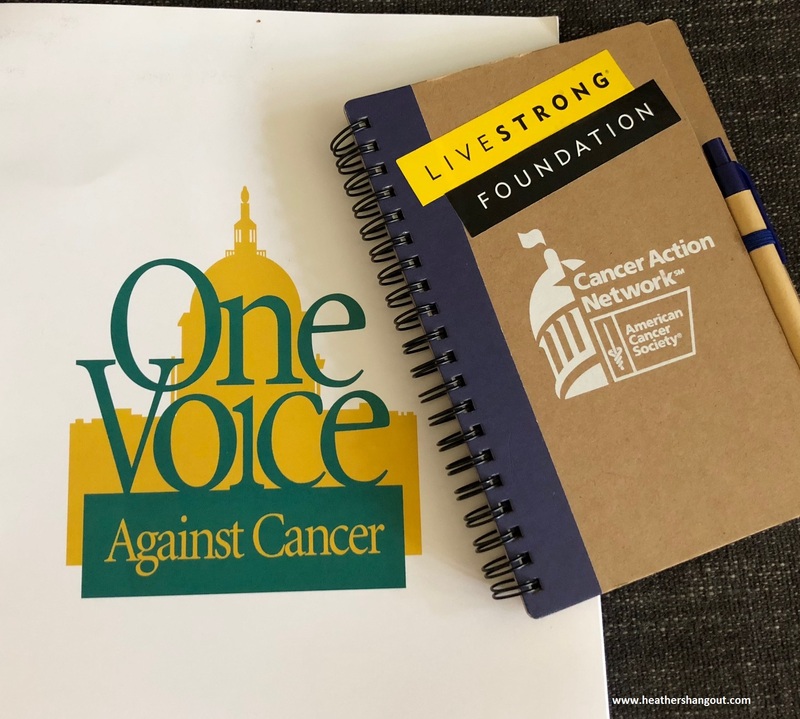 Last week, I once again embraced that chance at life as I represented LIVESTRONG in Washington, DC at the annual One Voice Against Cancer lobby day (read my past blog on my first time to OVAC). 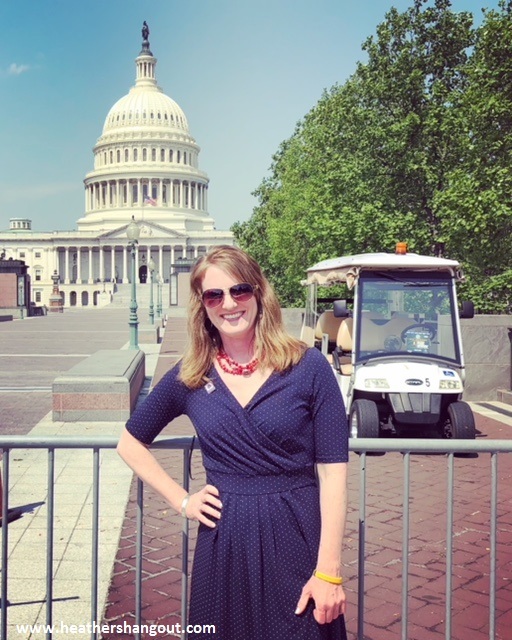 OVAC is a collaboration of national non-profit organizations bringing a unified message to Congress and the White House on the need for increased cancer-related appropriations. Numerous organizations, including LIVESTRONG and the American Cancer Society Cancer Action Network (organizations I’m actively involved with), are part of this collaboration. This year’s OVAC event brought almost 100 cancer advocates from 32 states who attended more than 130 meetings with our senators and representatives. I love attending OVAC and similar events. There is positive energy, motivation, empowerment and determination flowing from people whose lives have been touched by a disease that knows no limit in who is affected. Every time I participate in an event like this, I meet new people with their own unique stories. Some will only cross my path that one time. Others lodge in my heart, becoming dear friends. All of their stories stay with me. No matter what type of cancer touched your life, we all have a common bond. At OVAC, we use that bond to try to make a difference in the fight against cancer. Love being in our nation’s capitol. Volunteering to use my voice to help others and help put a damper and eventual end to this disease just seems natural to me. I’m alive, I still have a voice. I completely understand that not every cancer survivor feels, nor wants, this, and that is so perfectly acceptable. We must all lead the life that works for us. I personally thrive in this space. The merging of helping others, working to make a difference, meeting thousands of like-minded people, seeing the positive outcomes of our successes, and even feeling frustrations that simply push my determination…..these all come together to remind me of the beauty in life. I usually learn a little more about me, understand a little more about others, and become a little more aware of the path in front of me. Our goal at this lobby day was to secure commitments from Congress to support more funding for cancer research and prevention programs. Approximately 1.7 million Americans will be diagnosed with cancer this year, with more than 600,000 dying from it. Almost half of these deaths could be prevented through available clinical screenings. Direct treatment costs and lost productivity cost the U.S. economy more than $216 billion annually. Research can help dramatically improve these results. Today, there are more than 15.5 million cancer survivors in the U.S., including me. But I know we can do better, don’t you agree? We know that while no one is in support of cancer, not everyone supports funding increases for these programs. While we’ve made progress in the past, there is an unacceptable number of people being diagnosed and dying from this disease. Thus, the importance of coming together with one voice to remind our representatives, the people who represent you and me, of the critical need for research and prevention programs. Many of you are familiar with my story – diagnosed at 21 with osteosarcoma, an aggressive form of bone cancer. Treatment consisted of 13 months of chemo and surgery to replace my femur and part of my tibia with a titanium rod. It was hell. But I’m still here, 20 years later. A few years after bone cancer treatment ended, I discovered a melanoma spot on my leg, and another last year on my arm. Thankfully those were treated with surgery. I credit research for new testing, treatment and technology for saving my life all those times. My dad is always in my heart as I advocate. My family’s cancer story unfortunately did not center on only me, something I would truly prefer (I usually hate being the center of attention but I’d take it all in this situation). In the midst of my chemo treatment, my dad had been feeling tired and achy. He finally went to the doctor, who told him it was the effects of worry and stress of having a daughter with cancer. Then his ribs cracked when he sneezed. Then his arm bone cracked as he lifted a piece of drywall. Tests soon discovered my dad had multiple myeloma, a cancer of plasma cells in bone marrow. He was originally given ‘maybe’ three months. My parents said no thank you. His first stem cell transplant put him into remission (he came home on his 50th birthday). Less than a year later, he relapsed. By then we had found a myeloma specialist at a local hospital in Detroit so he switched to her. She was an angel – matching my dad’s sense of humor and determination. Using her contacts around the country, she found a new drug to try and he went into remission for over a year. Then he relapsed. Another new drug and another bone marrow transplant put him into remission. And then he relapsed. By then he had undergone two open heart surgeries to replace a leaky heart valve, and was now on dialysis. And research hadn’t caught up with his cancer. There was no new drug. My dad made the brave decision to stop dialysis and walk the path of his choice. I still recall him telling me a few days before his death that cancer had not won this fight because he was leaving his story in the hands of a very capable storyteller (turns out he meant me. My parents have always been my biggest cheerleaders.). And so I share his story when I talk about the importance of cancer research. His story, and thousands of others, who were able to live their life, even if just a bit longer. As a young adult cancer survivor, I have faced many side effects and health concerns in the past 20 years. Research has helped manage these, and sometimes prevent them. A decade before my diagnosis, amputation was the common course of treatment with chemo. Thankfully, limb salvage became an option, first with cadaver bones and then titanium. 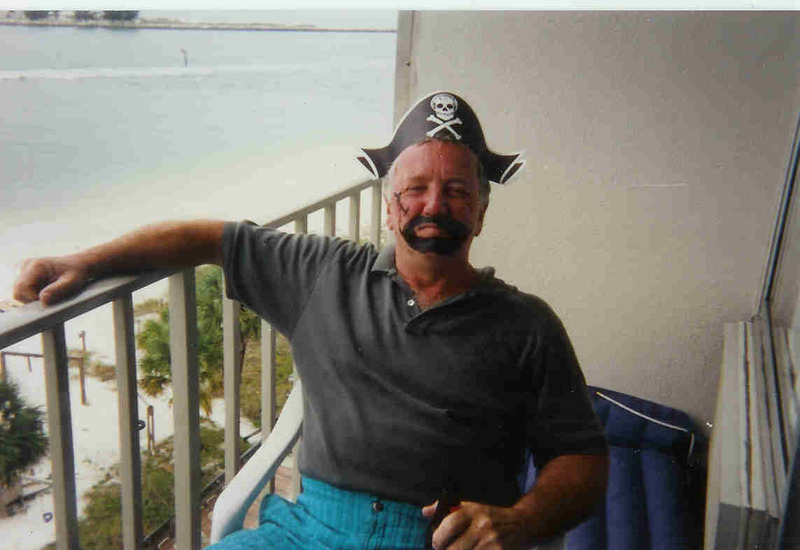 New drugs and treatment protocols helped my dad live six years past his diagnosis, and even though my dad died, my family and I are forever grateful for the six special years we had with him. Consider the powerful and life-changing impact of cancer research on my family, and then think about the millions of other cancer survivors who have lived for years or decades past diagnosis and the families who can create new memories. Or the people who never hear “you have cancer,” thanks to the available preventative programs. This is why passion and determination flow through me at the thought of cancer advocacy. This is why I openly share my own cancer story, and my dad’s. This is why my heart swells at thoughts of the people I have met throughout the past two decades of being a survivor. This is why I know we are making a positive impact in the fight against a terrible disease. Because when we come together with one voice, we tell cancer that it will not win. Not today, not ever. If you’d like to learn more about getting involved in advocacy, check out LIVESTRONG and American Cancer Society Cancer Action Network (click on your state). Thanks Heather! Your story rings true with my family and what we went through with our Dad and cancer. Thanks for all you do! It was a pleasure to meet you at OVAC, sorry we didn’t have time to chat.